State Prison for Men is located in Concord New Hampshire. It is the oldest correctional facility in the state with parts of the prison dating back to 1812. It is a multi custody facility that can house up to 1,205 adult males. Inmates at this facility are classified by 'C' number, general population is C3 and maximum security is C5. 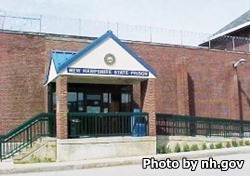 All new male commitments in New Hampshire go through the Reception and Diagnostic Unit located at the State Prison for Men. Offenders at the State Prison for Men can receive medical and dental services in addition to psychiatric treatment. While incarcerated inmates are encouraged to take educational programs to earn a high school diploma or GED. Anyone wishing to visit the State Prison for Men must fill out a visitors application first and wait for approval. Once approved you may visit an inmate during the visiting days and times listed. Everyday from 8am-10am but the inmate must initiate a visit by sending a request to the staff for approval, then they will relay the day and time to the visitor.